I played arround with Metadata and the Smart Library and now i would reorganise all the stuff because the Metadata that come with the Products are as organized as the Contentfolders itself ;-). First question is, if i have my own Metadata created, what will the DB do with them if i reset the DB or if i Re-Organize the DB out of the Content Tab (Content DB Maintenance) ? - Will it overwrite my own Organisation to the Defaults? 2. If i rightclick on any Stuff, there is the entry "Database" with a smal arrow, but there were nothing happend by click on. 3. I followed an tutorial to create Metadata for the Smart library, but there is no way to get the compatibility working well, any tips? 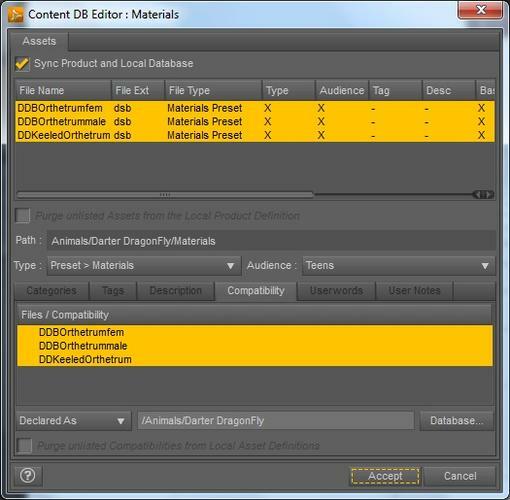 4. why is the category in the Content Pane difficult to the Category in the Metadata-Editor? - Two different Places and Lists to Store SAME Product-Informations? - Lol! 1) You can't 'reorganize' items out of the Content Library tab. They'll still be there, and in the same locations whether they have metadata or not. Metadata just allows the Smart Content tab to find them and categorize them appropriately. It also allows for items to be context sensitive so that only compatible items appear. If you re-import metadata it will overwrite the defaults unless you tell it otherwise (there's a check box). 2) No idea, but I've never needed it when creating metadata, so I generally don't worry about it. 3) I wrote a tutorial on this earlier. Here is the link. 4) The categories in the content library are dependent on where they are saved. The categories in the Smart Content tab (ie, metadata) are specific to the product and vary from item to item. There are two key points to getting the Compatible items to link together (clothing->materials, figures->poses, figures->morphs, things->things, etc). 1. Use the "Scene Identification" function and identify items that can have items associated to it. 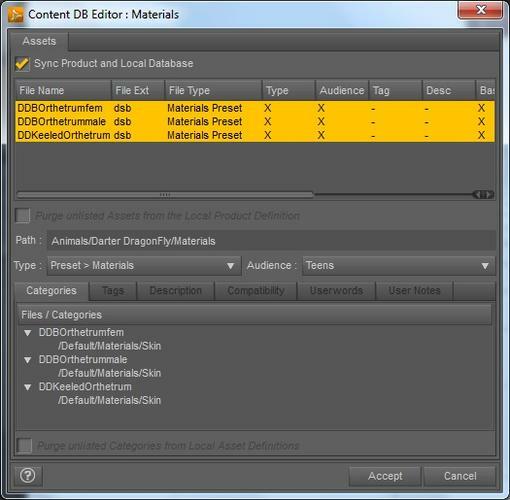 Load the item in a scene, select it and perform the Edit>Scene Identification command (as pictured in the bottom two images in HearldOfFire's tutorial here http://www.daz3d.com/forums/discussion/20018/#293866). Make sure the item has Content Type and Compatibility Base fields populated. Click accept to update the CMS database. If you defined the item's Type and declared a Compatibility base in the Content DB Editor first and then load the item, the Content Type should already populated and you'll find the matching entry when setting Compatibility Base. 2. Be sure the materials, poses, shapes, etc are categorized, otherwise SmartContent won't know where to display them on the Smart Content tab. thanks for the Links to the Tutorials, Looks similar to the Tutorial that i allready followed. Only the Thing with the Scene Identification was new for my, but also if i followed your Tutorial the Smart Content Tab did not show Materials for the Stuff. I tryed it with the Darter DragonFly (old Content), made the Darter DragonFly to an Actor, made a compatibility base "Animals/Darter DragonFly", set the Darter DragonFly (Actor) to the compatibility base, load the Figure to the Scene, did the Scene Identification to the Darter, go to the Materials of the Darter, in DB Editor i choosed "Presets/Materials" for Type, set "Root Category" to "Default/Materials/Skin", set Compatibility Base to the Animals/Darter DragonFly. I Reload the Smart Content Tab, the Darter DragonFly is there as Actor, but if i load it to the Scene nothing else Show up there. No Materials ... nothing ... only the Datrer DragonFly as Actor .... !??? Any Ideas ??? What did i do wrong ??? It frustrated me a bit becaue that was the 100st time i did try this. 1. Load the Darter Dragonfly into the scene. Click on the Presets group and you should see the materials that you associated with the Darter Dragonfly. Double click on a preset to apply the texture. No, nothing there! I reset my db because i would organize all stuff on my own. In this case, all i can see is the entry "figure" in the smartcontent. Under this "animals" and at least "air". seems not to be added to the SC-tab ! In the db editor the materials seems to be right! I controlled it by going the same way again and all the entrys were shown up! Any other idea? I see that it should going! Unfortunatelly i can't make a screenshot now, because my pc is off. I can post one tomorrow if needet! 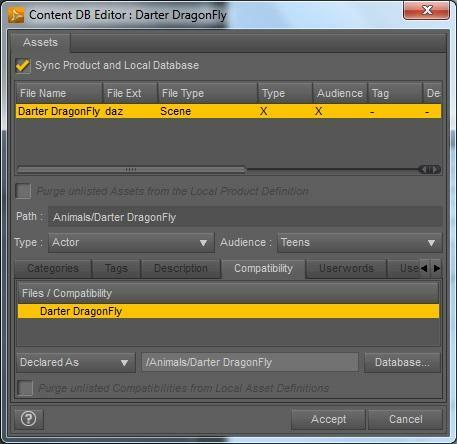 Here is a tutorial to setup the Darter Dragonfly and materials in Smart Content. Since you've gone though this process, some items will be already set, so just check that they reflect the stated settings. Good Luck! 6. Select Darter Dragonfly, right click select "Add root categories to selected file(s)"
12. 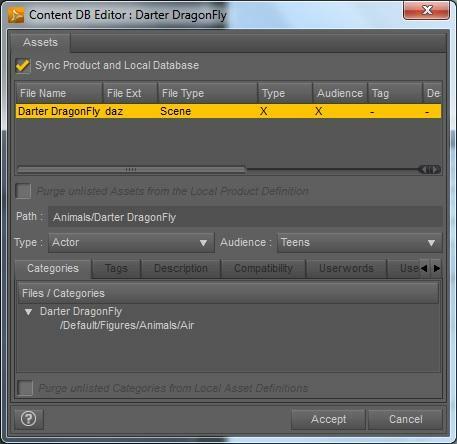 On the Scene Tab, with the Darter Dragonfly selected, launch Edit>Scene Identification from the Active Pane Options menu. 20. Select all three materials, right click select "Add root categories to selected file(s)"
26. 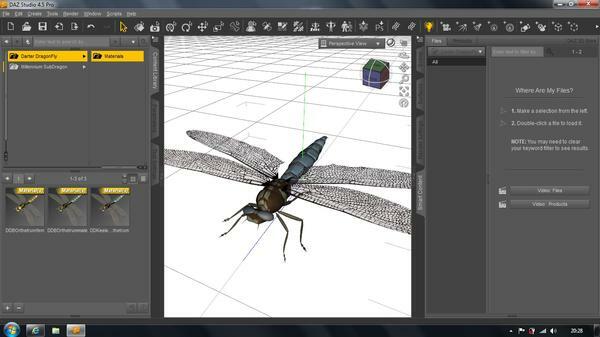 With the Darter Dragonfly in the viewport, select it. 29. The three materials are displayed as shown in my previous post. If I read that right then you declared the material as Animals/Darter Dragonfly instead of making it compatible with it. 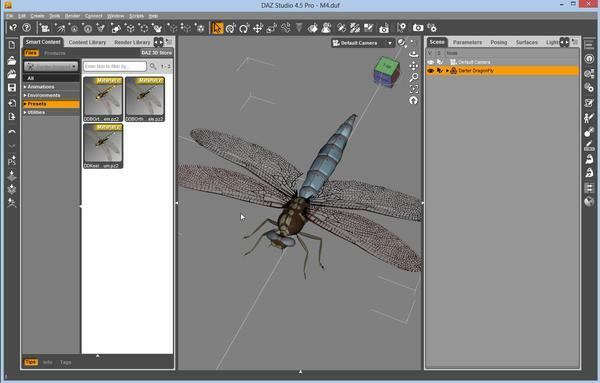 The 'Declared As' segment tells Daz what that object is meant to be, but if you right click the dragonfly in the list and add the Animals/Darter Dragonfly there it tells Daz what it's compatible with. Once that's done, and the Dragonfly is identified, your materials should show up fine. Be sure to deselect the dragonfly and reselect to repopulate the Smart Content tab. No i declared the Materials as "preset/materials/skin". I set the compatibility to the "Animals/Darter DragonFly", as written in the tutorial. Unfortunatelly it won't work! Ok, that is the point where i decidet to uninstall the content database and never touch it again, lol! Thanks a lot for all the help to try to get working it for me! - The compatibilities window showing the Dragonfly model, expanded as necessary and including the declaration at the bottom. - The compatibilities window showing the Dragonfly materials, expanded as necessary and including the declaration at the bottom. This will pinpoint exactly what the issue is with the metadata so we can help further. It can be a tricky thing to get nailed down without all of the information. Yes of course, i will post screenshots of all this in the evening ( mez ) , so in 4 1/2 houres! here are the Screenshots of the configuration i have made and my Problem that nothing appears in the Smart Content Tab after loading the DarterFly. Hope you will find the error that i made ;-). I don#t beleave it, i found my mistake ;-) ! HeraldOfFire you were right !!! I declared the Materials like the Darter DragonFly as "Animals/Darter DragonFly". Now i changed this to Not Declared and rightclick to the Textures and set the Compatibility to the Darter DragonFly. And... what should i say ... BINGO ! That was it ! Muchos Gratias to both of you! You saved my life ... ahmm ... the life of the Content library on my PC ;-) !! ok, after that i get the Smart Content working, thanks to HeraldOfFire, i want to edit my Genesis-Stuff. Now my next question: Is it possible to manage the Genesis Content so that it will look like the following? If Genesis is Loaded, next that will be shown in the Smart Content Tab is under Female "Victoria 5, Stefanie 5, Aiko 5 ..." and unter Male " Michael 5, Hiro 5, Justin 5 ...". I tryed that first with the Genesis Basic Female, Basic Male and Basic Child, but at all the Figures every Materials will be shown. I was made a Compatibility Base for "Genesis", "Genesis/Female", Genesis/Male" and "Genesis/Child". After I select Genesis it will be shown Basic Male, Basic Female and Basic Child, that is right, now i added Victoria to Genesis but she does not appear. Hope that would show what i was trying to get. Unfortunatelly i'm not at home so i can't try out until evening. But first off all i would know if this way of the organization of the Content is possible. To do that you would have to change the categories for Victoria, Tori and so on. The category tells Daz where it's displayed in the list. So, in your example Victoria 5's category would be '/default/figures/Female/Victoria 5', You could put Supermodel Vicky in the same category along with Tori and Gabi.